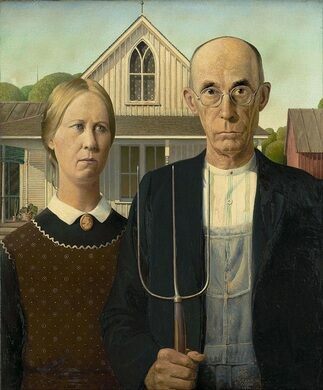 Most people know the artist Grant Wood for “American Gothic,” the iconic painting that typifies his unique style of Regionalism. While lesser known, some of Wood’s largest works in the Regionalist style are not in a museum or gallery, but on the walls of the Parks Library at Iowa State University. There are several walls of the old section of the library that show Wood’s work, including the agrarian-themed murals in the foyer titled “When Tillage Begins (Breaking the Prairie).” There are others highlighting the farming and agricultural arts (animal husbandry, veterinary science, and farm crops), and other fields of a working and artistic life (chemical, mechanical, aeronautical and civil engineering, as well as home economics, and ceramics). Wood designed the murals for the original library building under a commission from the University and the Civil Works Administration (CWA), an offshoot of the Depression-era Works Project Administration (WPA). 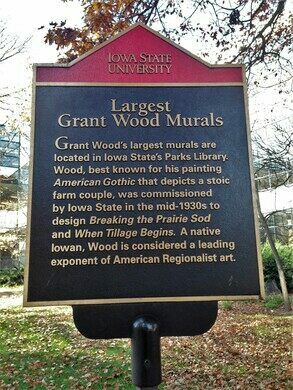 The paintings were then executed with the help of local Iowan painters, who were chosen by Wood from those he had seen exhibit at the Iowa State Fair. Wood led a trio of artists known as the “Regionalist Triumvirate” in the mid-1930s, dedicated to throwing off the conventions of European movements in favor of a specifically American style using rural subjects. 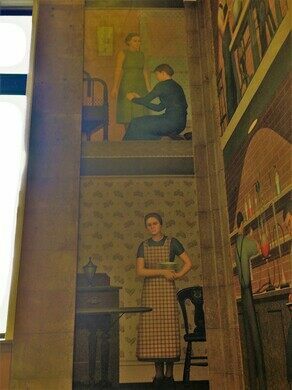 The Library Murals are a perfect representation of the style, honoring the value of work and the American Midwest at a time when the country was falling deeper into the Great Depression. Bringing Wood’s work to the public, at a university library rather than behind a velvet rope, provides a rare opportunity to experience one of America’s great artists right up-close. 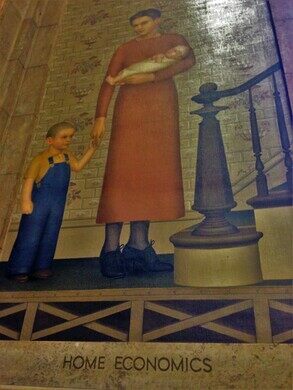 You can see other examples of CWA murals here and here. Parks Library is on the campus of Iowa State University in Ames, Iowa. Parking can be difficult since the Library is in the middle of campus. The Memorial Union, located on Lincoln Way, has a ramp for parking and the Library is just a short walk.